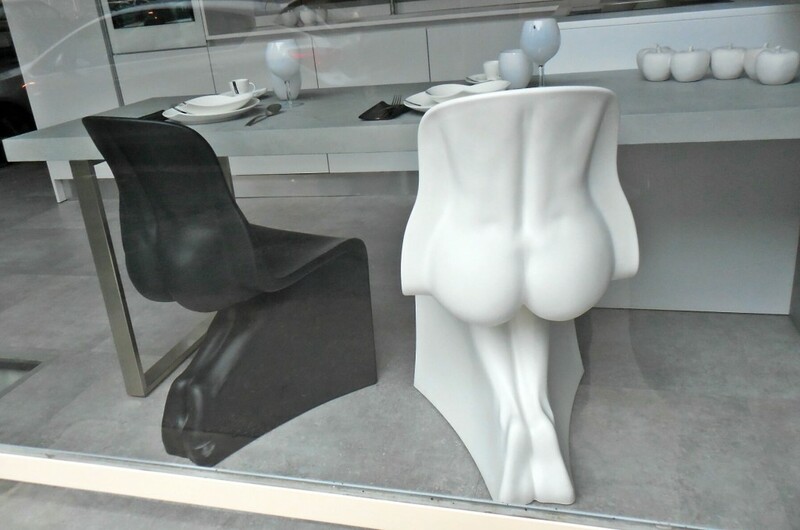 Grotesque is a word that I might have used to describe the chairs shown above which I saw in a furniture store window a few days ago. 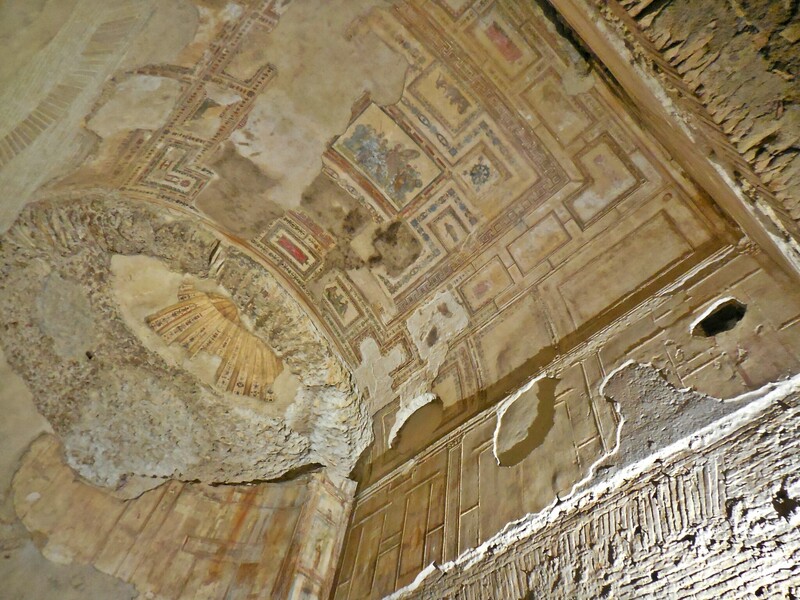 However, last Saturday, I visited the Domus Aurea (Golden House) and found out how the word actually originated. The Domus Aurea was an immense villa complex built by the emperor Nero after the Great Fire in AD 64. Reputed to be between 100 to 300 acres, it was extensively landscaped and included an artificial lake. The lake is now the site of the Colosseum. The villa was built as a place for entertainment and was decorated with gold leaf and precious stones. 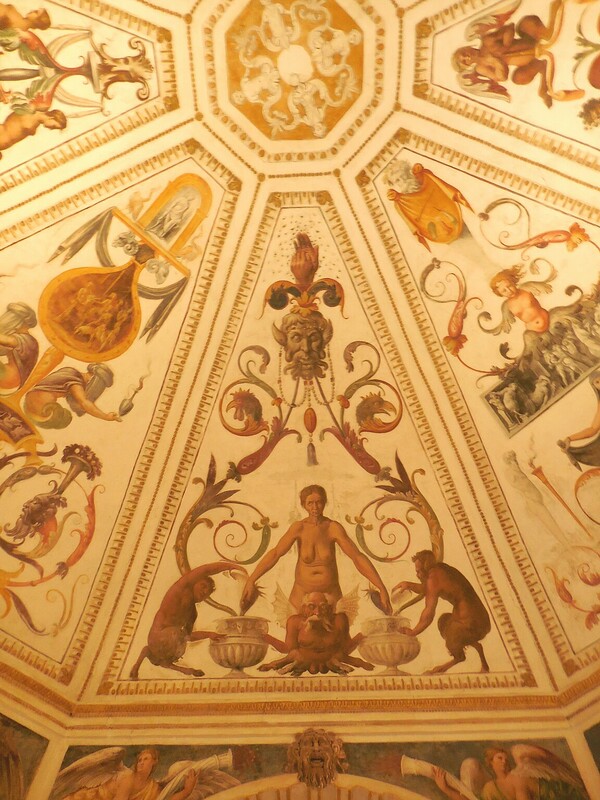 The walls and ceilings were completely covered with frescoes done in the decorative Roman style which includes winding floral motifs and unusual hybrid figures, sometimes half human and half animal. A few years after it was completed, Nero comitted sucide and the emperor Traiano had a platform constructed over it so that he could have his bath complex, the Terme di Traiano, built. The Terme themselves fell into ruin and consequently, the Domus Aurea became completely buried underground. Excavations are still in progress and one can visit parts of it only by taking a guided tour. Sadly, early excavations exposed the frescoes to air and humidity and little is left of them. In ongoing excavations, the frescoes are being carefully taken down so that they can be preserved. Anyway, to continue with the story of ‘grotesque’, in the 1500s, a young Roman apparently fell down a hole into what he thought was a cave (la grotta). 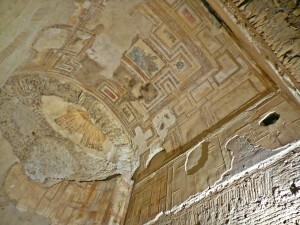 In fact it was the Domus Aurea where the frescoes were still preserved in all their splendour. Renaissance artists like Michaelangelo, Raphael and Pinturicchio crawled through holes to see ‘le grotte’ and introduced this style of decorative Roman art into Renaissance painting. It came to be called ‘grottesche’ (from a cave) and the word spread across France and Germany often also in reference to the bizzare and incongruous since the hybrid figures were so unusual. Over time, the word grotesque also came to mean ugly, distorted, disgusting or inappropriate to a shocking degree (which brings me back to the chairs!). The sad incidents in Paris last week might also be described as grotesque. There is fear in Rome and other Italian cities that terrorist attacks might occur here and rumour has it that the Vatican is a possible target. How it would be possible to screen the hundreds of tourists who line up to enter St. Peter’s basilica and the Vatican museums is beyond imagining. 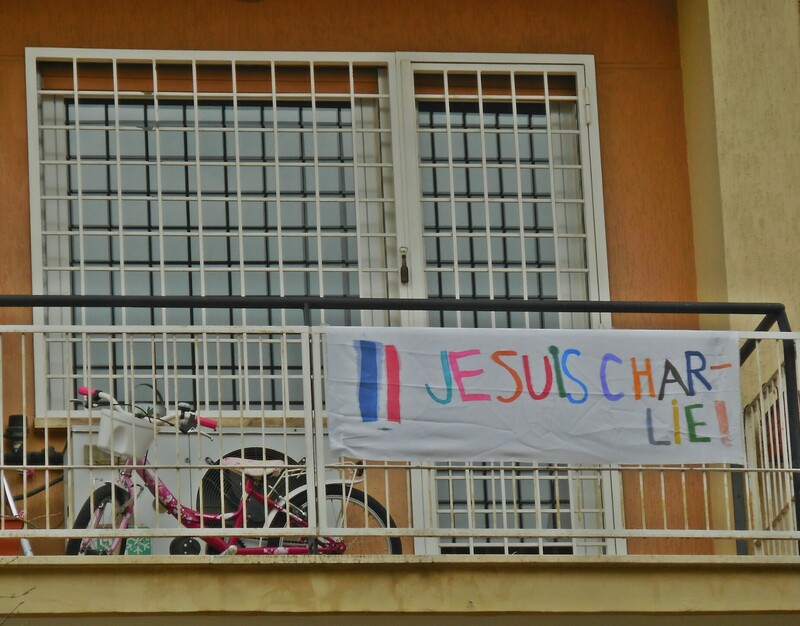 Meanwhile, the ‘je suis Charlie’ slogan is spreading even here. 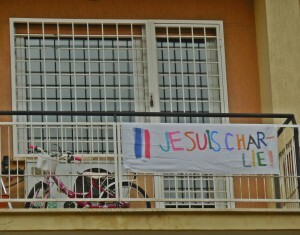 A balcony on our street has this banner across its railings. Walking home in the dark yesterday we thought it read ‘Jesus Charlie’ which would not be far from the cover of Hebdo magazine this week which depicts a cartoon of a weeping Prophet Mohammed saying ‘je suis Charlie’. Let’s hope that the horror ends and that there is no further backlash by jihadists, or towards peaceful Moslems just trying to get on with their lives.